For Twitter’s IPO, will hope count for more than cash? When Twitter sells its first shares to the public, likely sometime next week, it hopes to cash in on investors’ renewed appetite for technology companies — especially ones in the social-networking or mobile-web spaces (or, as with Twitter, both). But whether Twitter can ever actually make money off its billions of 140-character messages is very much an open question. From its inception in 2007 through September, Twitter has piled up cumulative losses of $483.2 million, including nearly $134 million in losses in the first nine months of this year. The company’s revenue more than doubled from the first nine months of 2012, to $422.2 million, but so did its expenses — and Twitter has warned prospective investors that it expects its torrid revenue growth rate to slow in the future. Of course, Twitter won’t be the first money-losing technology company to go public. 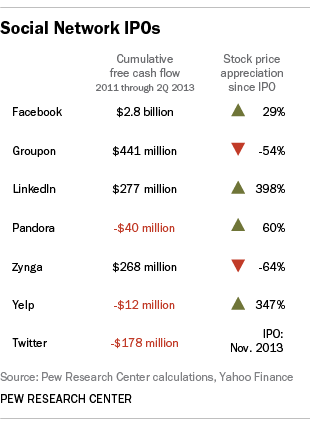 As Quartz noted recently, two-thirds of tech IPOs this year have been unprofitable. And Twitter, which only began to generate revenue in 2009, still looks more like a startup than an established business. Facebook generated nearly $2.8 billion in free cash flow in the past two-and-a-half years; daily-deals company Groupon generated $441 million over the same period. LinkedIn and Zynga also have been making money; moreover, all four were solidly in the black when they went public, unlike Pandora and Yelp (though the latter has recently turned around and is generating positive free cash flow). Twitter, however, continues to be cash-flow negative. Then again, stock-market performance doesn’t always align with financial performance, at least in the short term — and especially when investors can still plausibly hope for big profits down the road. Pandora and Yelp both are trading well above their IPO prices, while Groupon and Zynga shares are below their IPO levels; at both of the latter-named companies, free cash flow has dropped off markedly this year.